Ever watched a bad movie and said to yourself "I could write better than that!" Well here is your chance! 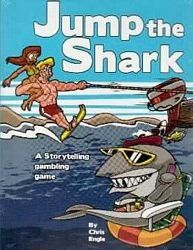 In "Jump the Shark" you and your friends are trapped screen writers forced to write bad movies. They make a gambling game of it so you get the dual fun of making up a great/horrible story and rolling dice. 3 to 6 players Less than an hour to play. No writing ability required!